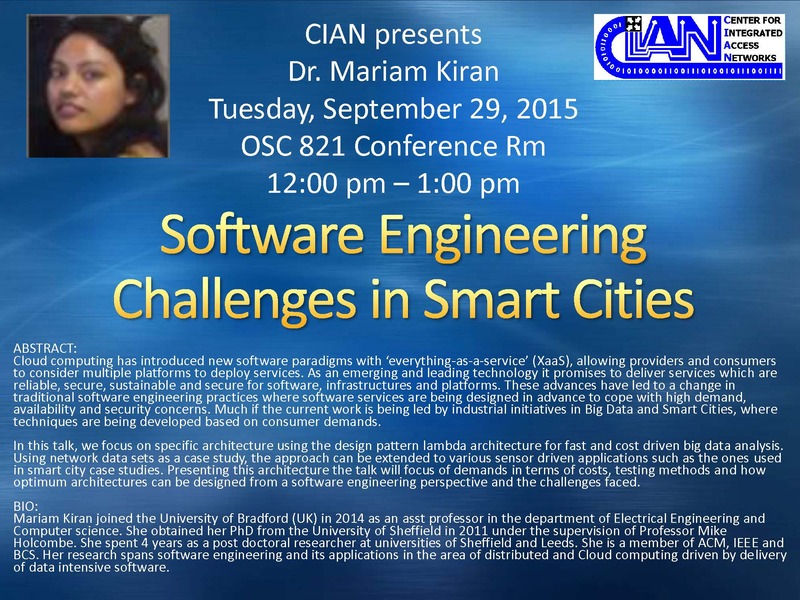 Mariam Kiran joined the University of Bradford (UK) in 2014 as an asst professor in the department of Electrical Engineering and Computer science. She obtained her PhD from the University of Sheffield in 2011 under the supervision of Professor Mike Holcombe. She spent 4 years as a post doctoral researcher at universities of Sheffield and Leeds. She is a member of ACM, IEEE and BCS. Her research spans software engineering and its applications in the area of distributed and Cloud computing driven by delivery of data intensive software. Cloud computing has introduced new software paradigms with ‘everything-as-a-service’ (XaaS), allowing providers and consumers to consider multiple platforms to deploy services. As an emerging and leading technology it promises to deliver services which are reliable, secure, sustainable and secure for software, infrastructures and platforms. These advances have led to a change in traditional software engineering practices where software services are being designed in advance to cope with high demand, availability and security concerns. Much if the current work is being led by industrial initiatives in Big Data and Smart Cities, where techniques are being developed based on consumer demands. In this talk, we focus on specific architecture using the design pattern lambda architecture for fast and cost driven big data analysis. Using network data sets as a case study, the approach can be extended to various sensor driven applications such as the ones used in smart city case studies. Presenting this architecture the talk will focus of demands in terms of costs, testing methods and how optimum architectures can be designed from a software engineering perspective and the challenges faced.